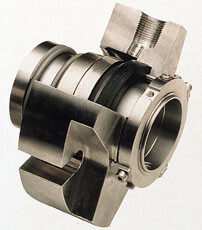 New Ansitex cartridge bellows seals for ANSI rotating equipment are available from Burgmann, of Houston. Ansitex seal glands have greater radial clearance around the seal for better heat dissipation and increased product circulation for longer seal life. The new seals are available with either elastometer or metal bellows to serve a wide range of pressure and temperature requirements. Both versions feature interchangeable components for reduced inventory requirements.